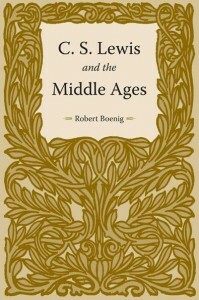 In C. S. Lewis and the Middle Ages, medievalist Robert Boenig explores Lewis’s personal and professional engagement with medieval literature and culture and argues convincingly that medieval modes of creativity had a profound impact on Lewis’s imaginative fiction. The Middle Ages affected Lewis in different ways. Early in his life he found medieval narrative compelling, sharing his love for it with others and first experiencing the intense spiritual longing he termed “joy” through his engagement with it. He went on to build a successful career as a scholar who was, as he put it, “chiefly a medievalist.” His creative writing not only evokes the Middle Ages but also adapts the medieval technique of appropriating and altering prior texts as a means of generating new stories. Understanding Lewis’s creative appropriation of previous sources is essential for a full assessment of his achievement as a creative writer. For Lewis, the medieval was above all a place where he encountered the spiritual. It was through the medieval in its mode of Norse myths, particularly those involving the Norse god Balder, that he experienced “joy.” He delighted in hunting this joy through medieval books, like those of Malory or Chaucer, and also through more modern works that evoke the Middle Ages, such as the prose romances of William Morris. Among the works of devotion and spirituality that Lewis continually read toward the end of his life were the medieval classics The Imitation of Christ by Thomas à Kempis and Revelations of Divine Love by Julian of Norwich. The medieval for Lewis was a place where he could—and did—encounter God. Using Lewis’s private correspondence, scholarly books and articles, and creative writing, Boenig charts Lewis’s involvement with all things medieval, demonstrating the importance of the Middle Ages in any assessment of Lewis’s literary achievements. AuthorRobert Boenig is professor of English at Texas A&M University. He has published twelve books and more than fifty articles in scholarly journals, including Speculum, JEGP, The Chaucer Review, Mythlore, and Seven, and has published editions of William Morris’s The Wood Beyond the World and (with Andrew Taylor) Chaucer’s Canterbury Tales.